10 fun infant activities to play with your 6-9 month old. These interactive baby games will improve your child's body awareness and motor development during the first year of life. Once babies hit about 6-9 months of age, they are able to participate in a greater variety of games and activities. At this stage, most of them are able to stand while holding onto an object, roll over, crawl and creep around on their own, sit while supporting themselves, and they have better control of their hands and fingers when grabbing objects. *Some of these infant activities are adapted from ideas found in a wonderful book, Games to Play with Babies by Jackie Silberg. 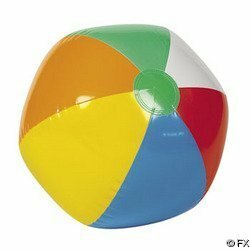 Beach balls are great for playing all kinds of games with your baby. Lay your baby across the top of the ball on his stomach, and gently roll him around. 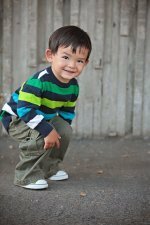 Hold him in a sitting position on top of the ball and gently bounce him up and down or roll and tip him in all directions. Hold his hands and help him beat on the ball like a drum. Toss the ball in the air and catch it while the baby watches. Drop the ball on baby's feet while he's propped up or sitting in a stroller and help him kick the ball up in the air. Drop the ball on his hands and help him hit it in the air. Roll the ball to him, and help him wrap his arms around it and then push it back. 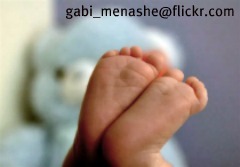 Tap the bottom of your baby's feet on the ball to different rhythms and at different speeds. Sit on the floor with your baby facing you. Ask him to act out a movement while you demonstrate it, then you repeat the movement with him. "Reach up high and grab a star." "Curl up small like a kitten." "Pretend to fall asleep." "Now, It's time to wake up!" See how many different types of movements you can think of while helping your baby start to use his imagination. Don't be afraid to act silly! Your child will love it. Lie on the floor next to your baby, place a small blanket or towel over your feet. Say, "1, 2, 3, kick!" and kick it off. Now place the blanket over baby's feet and count down, encouraging her to kick it off once you reach the word "kick." 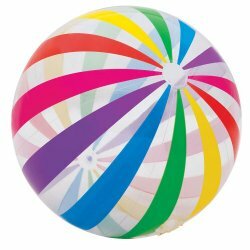 Assist her in kicking a beach ball from a supported standing position after your countdown. Pile up soft, lumpy objects for your baby to crawl all over. Pillows, blankets, sofa cushions, and large stuffed animals make great obstacles to climb over and jump in to. Chase your baby while she crawls and see if she will chase you. Place a toy just beyond her reach and encourage her to crawl and get it. Get down on the floor with your baby sitting in front of you, facing you. Give him one end of a long sock, dog pull toy, scarf, or small blanket while you grab the other end. Gently pull the sock toward you. You may need to help baby hold on at first and show him how to pull his end toward himself. Be silly and pretend that baby is so strong he pulls you over. As he gets a better grip, shake it and wiggle it to make it more challenging to hold on to. Rock back and forth while pulling. Sit on the floor in front of your baby while she sits in her stroller. 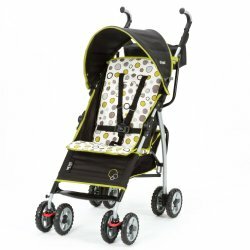 Grab the soles of her feet and gently push her so she rolls backward in the stroller. Pull her back toward you. Push a little harder and gently let go, so she rolls backward on her own. Dance with her while pushing the soles of her feet and move to different beats , spinning, and moving in a variety of directions and speeds. Sit on the floor in front of your baby. 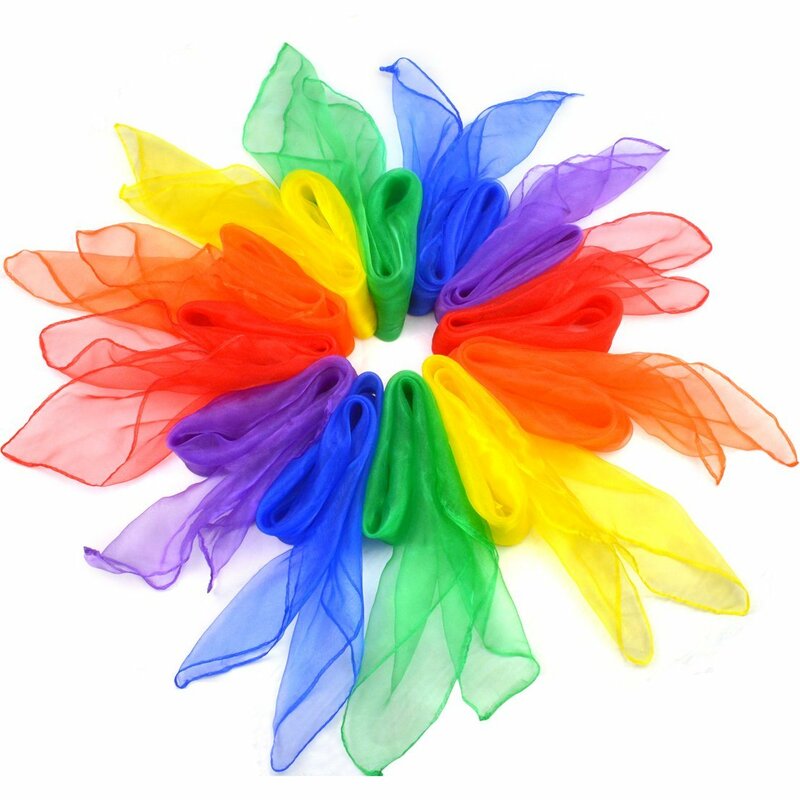 Toss an object up into the air that will float gently down (scarves are perfect for this), and stretch out your arms to catch it. Toss it up again so it drops over your baby and tell her to hold her arms out and try to catch it. Try catching it while lying down and standing up. 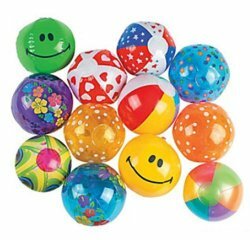 Try other soft objects like yarn balls, items of clothing, or stuffed animals. 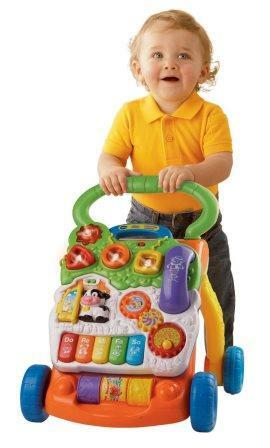 Place 2 toys in front of your baby and ask her to pick up one toy in each hand. If she doesn’t, place them in her hands. Set down a third toy in front of her, and ask her to pick it up. She has to learn to drop one to pick up the new one. Encourage her to reach for the new toy with each hand by trying to hand the third toy to her left hand and then next time to her right hand. Place objects to each side and have her reach across her body with opposite hands to pick them up. 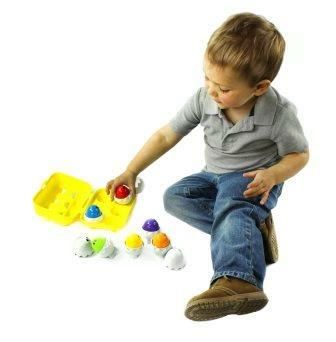 Put a toy in one of the cups in an egg carton and take it out. Show baby how to take it out and put it back. Put another toy into the second cup and repeat. Keep adding toys and other objects until you have filled all of the cups. Use a muffin tin, ice cube tray, or egg holder from the refrigerator. This is a great game for teaching sorting by colors, sizes, objects, etc. Place objects with different textures on the floor for your baby to crawl over. Try objects like a rubber floor mat, inflatable pool float, bathtub mat, wool blanket, soft bath robe, piece of velvet, throw rug, carpet sample, silk scarf, down comforter, etc. Crawl over them with your baby one at a time, describing how they feel. Make a trail with them and rearrange their order each time. Make sure your baby has the head and postural control to do these games. Don't be afraid to act silly and make silly noises. Have baby play some of the games while standing. Walk when possible as opposed to crawling.